Nothing says Australian Food like some good old Bar-Bq and meat pie. For many of you MASTER CHEF is what really defines Australian food today. However, there is more to it than just that. 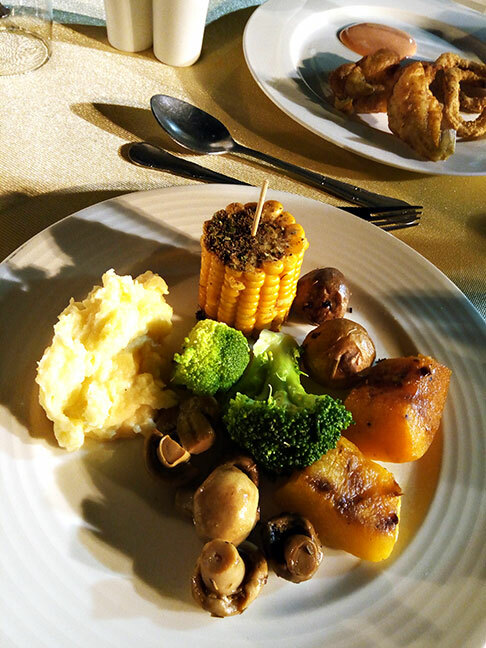 The Australian Food festival held earlier this month at Avari Towers was a very simple affair (in terms of food) and by far one of my favorites in the series. Even though it ended I just had to share my experience so when Avari Towers celebrates it again you can go enjoy it. Australians have not inherited any food in the traditional sense, the cuisine has evolved into a diverse mix by adapting different cultural influences, mainly British and Irish when they first settled in Australia. 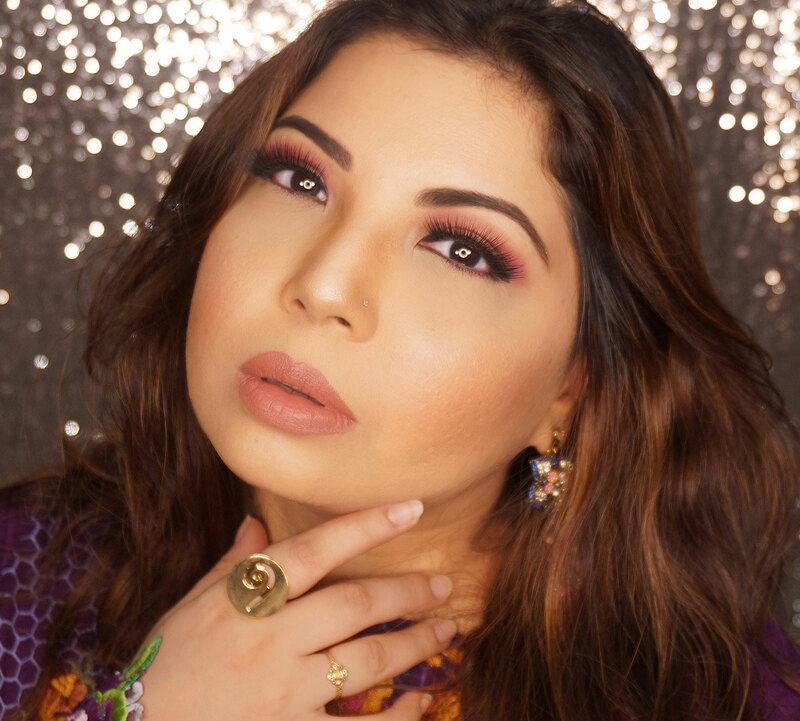 Initially the food was very bland and basic but things began to change in the late 60s because after world war 2 millions of migrants arrived from Asia, Europe and Middle East which also brought a significant change in the food culture. So, over the years Australian Food history has become more dynamic and evolved. Today Australian Cuisine is outstanding and unique because of the different cultural influences. "No other country on earth offers more of everything needed to make a good meal, or offers it more cheaply, than Australia; but there is no other country either where the cuisine is more elementary, not to say abominable," said Edmond Marin la Meslée, founder of the Geographical Society of Australasia, in his 1883 book, L'Australie Nouvelle. The climate makes BBQ Common place and with abundance of other fresh produce the sidelines are also diverse. Even though I was looking forward to trying some Kangaroo meat alas, it was apparently not approved for shipping to Pakistan, meh! Let me first tell you how amazing the quality of Australian meat is, specially red meat. You see all those giant cows on Bakra Eid? MOST of them are from Australia. 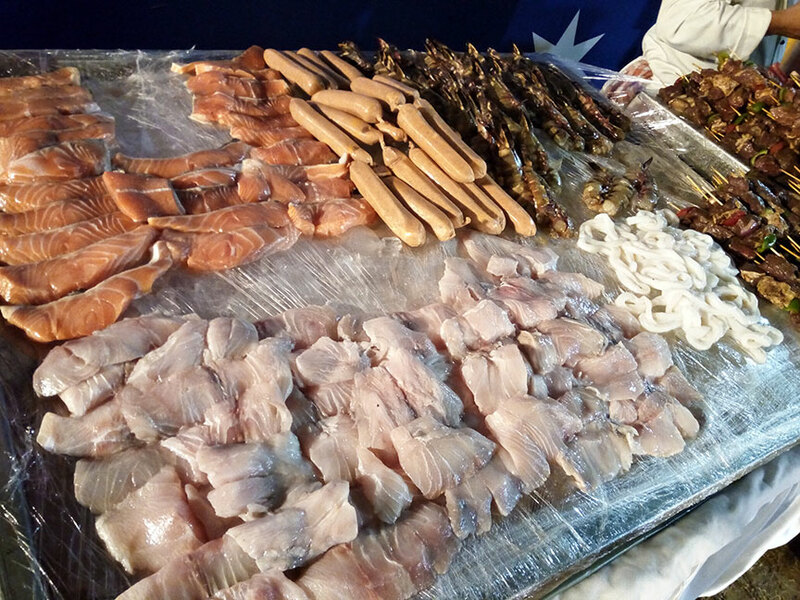 The abundance of fresh meat, poultry and seafood adds to the great food experience which I thankfully went through during the Australian Food Festival in Avari towers Karachi. To top it off they especially called in a Professional Australian Chef who took the food to another level. 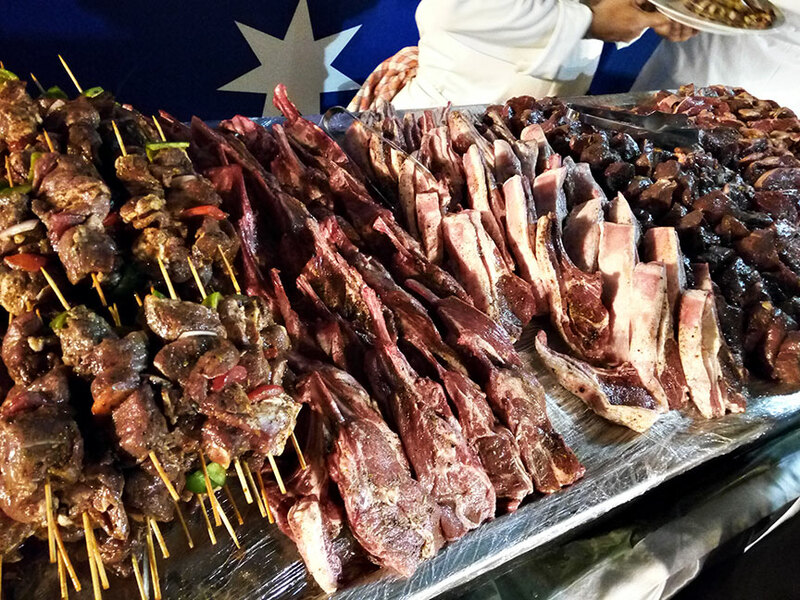 The Australian Food Festival was like a BIG BBQ night. You got all these assortments of meat to choose from; from pre-seasoned filet mignon to tiger prawns, from sausages to salmon or chicken, the choices were plentiful. You also got a choice of frying or grilling, fresh, along with an array of sidelines. While my selected meat was grilling I nibbled on some freshly fried Calamari and fried fish. The seasoning on the calamari batter was light and added a nice punch to the normally bland taste of the calamari itself. 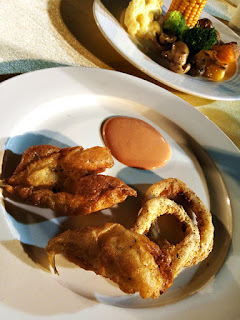 Not to thick nor oily, cooked till chewy yet not rubbery, Calamari was a good starter for me. The fried fish was a bit too oily and I tasted more batter than fish so I didn't continue further than my first bite. Tasting oily batter is not enjoyable. The Sidelines were exciting for me. Usually you just get the generic mashed potatoes, fries or sauteed/grilled veggies, but here the BBQ's sideline game was strong. Corn on the cob had tangy seasoning but was grilled a bit on the harder side. 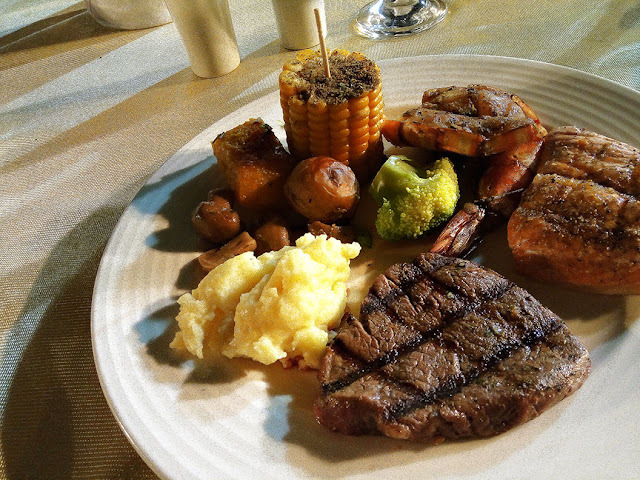 Corn should be softer when you are having it as a sideline to make it easier to eat with your meat. Garlic and Thyme roast potatoes, Steamed broccoli and the mushrooms were appetizing but my favorite were the Buttered Mashed potatoes in truffle oil and Roasted Pumpkin in garlic butter and rosemary. We have been spoiled by bad mashed potatoes in Pakistan. I have rarely come across mashed potatoes which are seasoned correctly and textured properly with the right amount of butter and mashing. Most of the time you get a cold, chunky mess as a sideline. The mashed potatoes at this BBQ were warm and creamy while the subtle buttery flavor was not over powering and I felt like I was eating fluff. Roasted Pumpkin was a great combination of subtle crunchy top layer and a smooth gooey inside. I ended up having the mashed potatoes and pumpkin mostly with my main meat because they complimented the flavors perfectly. 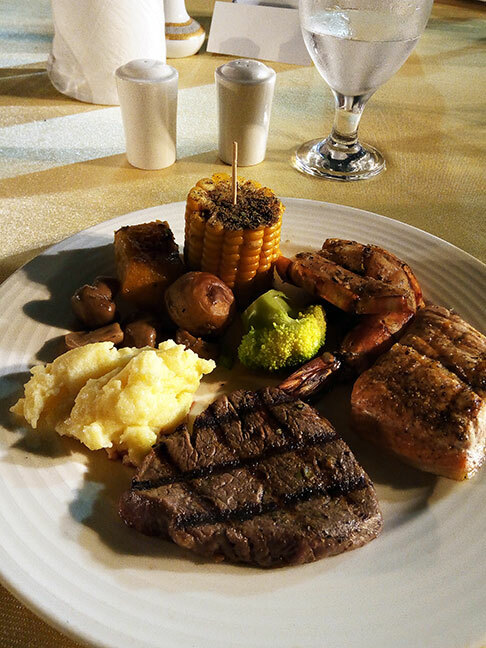 For my meat I selected Tiger Prawns, Beef Filet Mignon and grilled Salmon. All three were an immense delight for my palate. The main reason being the great balance of subtle seasoning while retaining the actual rich taste of the meat itself, especially the filet mignon. I enjoyed the tiger prawns but I was more inclined to gobble down the medium rare filet mignon and grilled salmon. Both were cooked enough for the meat to retain it's moisture yet every bite was fathomable. The salmon literally melted in my mouth but it was not over cooked. The filet was just the right texture, chewy while sustaining the richness of the fatty meat. Little chomps of delight. Even though there were a lot of dessert options I had my eyes set on the Pavlova, for obvious reasons. Pavlova is one of the signature Australian desserts. 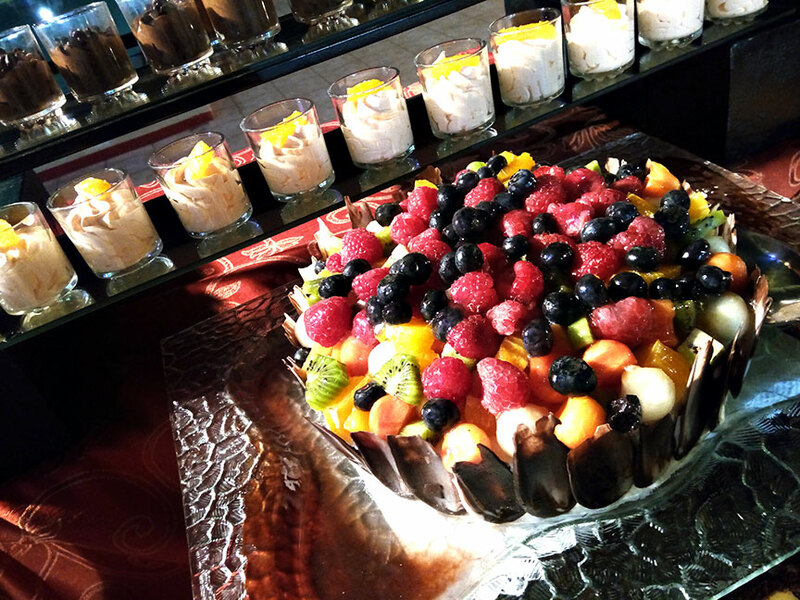 The crisp meringue layers is filled with whipped cream and fresh fruits. A crunchy exterior and soft, marshmallow like interior with a mix of tangy, soft and sweet, just imagine your senses going into a melodious hyper drive. For more global food festivals you should stay up to date by following the FACEBOOK page of Avari Towers Karachi. Trust me, you don't want to miss out on great food experiences.